LEAVE THE BOTTLED DRESSING AT THE GROCERY STORE AND JUMP INTO THIS CREAMY AVOCADO BLUE CHEESE SALAD DRESSING. Watch out…I’m bringing the best of my game with this Creamy Avocado Blue Cheese Salad Dressing which is low-carb, sugar-free and gluten-free. Whether you’re a fan of blue cheese or not you can adjust the amount you use or find a brand that is not heavy on the blue veining. Please don’t run off when you see the words ‘low-carb’ because that steak you eat is low-carb too as are eggs, cheese, spinach and lettuce greens. Low-carb is just a way to say there aren’t that many carbs in the recipe or food you are about to make or eat. There are no toxic weird science projects going on behind the scenes and low-carb doesn’t taste like horrifying diet food. Once the hot weather is here the back-yard BBQ party invitations will be arriving and you’ll want to bring something unique. One of the things I love about pot-lock parties in the summer is that we get the opportunity to try different kinds of foods. I recall one of the parties we attended had a party-theme where we could only bring something that was not typical of a pot-lock or party food. What that meant was no crock-pot meatballs, spinach dip and pumpernickel bread, bagged chips, hotdogs etc. There was a list we had to abide by if we wanted entry into the party. All in good fun though. This was motivating the guests to think about what they were making and to be adventurous trying new recipes or even creating them. If you’re that person who runs to Metro just before a party to grab something that is pre-made this type of party is not for you. In keeping with our frugal lifestyle Mrs. CBB and I went the salad dressing route because we know that most people tend to buy it pre-made, us included. We don’t always make homemade salad dressing especially if there is a long list of ingredients. You won’t find that with our Creamy Avocado Blue Cheese Dressing. The best part was that everyone loved it and no one knew it was low-carb until we told them. It’s really just a fancy term! Blue cheese also known as “Gorgonzola” in Italian is a pasteurized soft and crumbly cheese with 25-35% milk fat. The cheese is also aged for approximately 3-4 months. For this Avocado Blue Cheese Salad Dressing we chose a French Blue cheese called Bresse Bleu which is creamy and easy to incorporate in our dressing. Bleu de Bresse is a blue cheese that was first made in the Bresse area of France following World War II. Made from whole milk, it has a firm, edible coating which is characteristically white in color and has an aroma of mushrooms. Its creamy interior, similar in texture to Brie, contains patches of blue mold. It is shaped into cylindrical rounds weighing from 125 to 500 grams (4.4 to 17.6 oz). Regular price for a 150g pot of this blue cheese it will cost you $8.99 unless you happen to find it 1/2 price like we did. This may seem pricey but remember it’s pungent and goes a long way. I find it’s easier to add what you need as you go just to make sure the flavour is consistent. You can find this blue cheese at any grocery store that has a cheese counter with a variety of cheeses from around the world. Off the top of my head, Metro, Sobey’s, Zehrs, Walmart, RCSS should all carry blue cheese. I’m not sure if Food Basics or No Frills carry this but it’s worth a check. You don’t have to use the same blue cheese we’ve chosen either. Go with any brand you like. Avocado Blue Cheese Salad Dressing isn’t just a dressing for salads because you can use it as a dip, sauce or even a spread depending on the thickness consistency. If you create a thicker consistency you can spread the blue cheese avocado salad dressing on crackers. Top it with a slice of tomato, hard-boiled egg or salami with salt and pepper and you’ve got a lovely snack. I haven’t tried freezing the Avocado Blue Cheese Salad Dressing and would suggest eating it with-in a few days but it never lasts that long around here or at a party. You’ll see. 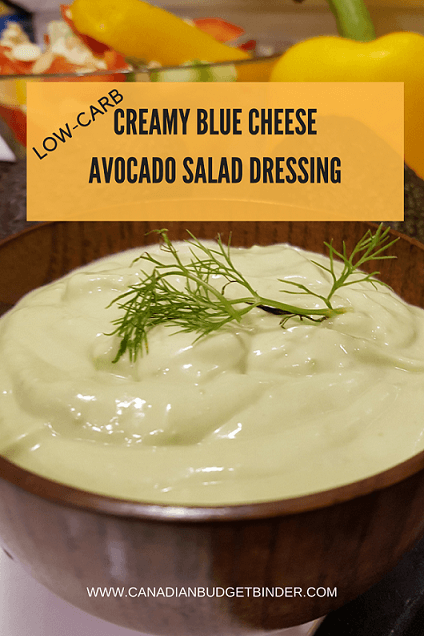 Bring something special to the next backyard BBQ party or any lunch, dinner or special occasion with this low-carb Creamy Avocado Blue Cheese Salad Dressing. It's not just a salad dressing... it's lots more. In a medium bowl mash up the avocado with a fork then add the rest of the ingredients. With a hand blender whiz the dressing up in the same bowl until creamy and smooth with a consistency for what you are serving it with. If you want it thicker use less liquid. This is for salad dressing consistency. See, wasn’t that the easiest low-carb salad dressing to make? 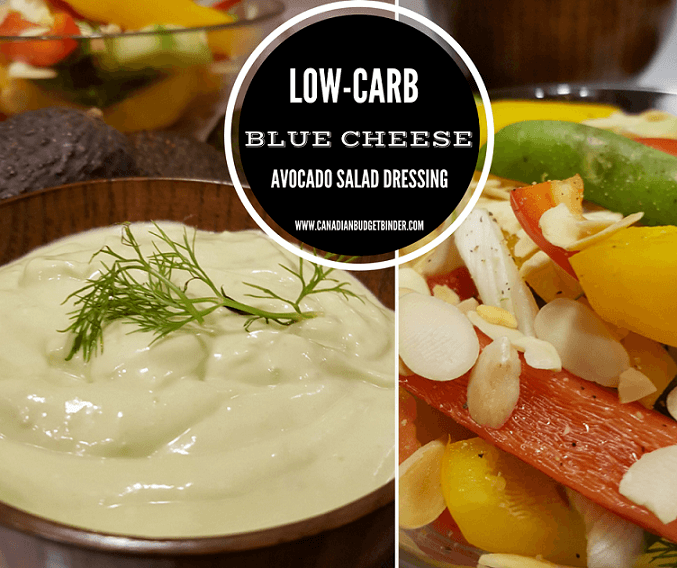 You can add other flavours as you want but this Avocado Blue Cheese Salad Dressing is a base for other ingredient options. Serve at room temperature to bring out the flavours. Per entire Recipe 6 servings: Net Carbs -2.70g, Fat 118g, Protein 1.10g, *Using Atkins Carb Counter /Total Carbs 2.70g or 0.45g per serving.